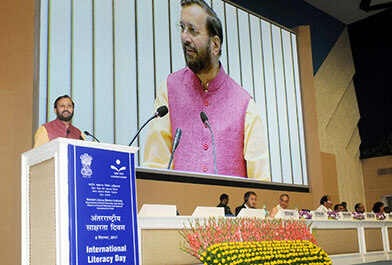 New Delhi: The National level function to celebrate 51st International Literacy Day was organised by the Ministry of Human Resource Development, Government of India in New Delhi today. Honorable Vice President of India, Shri M. Venkaiah Naidu was the Chief Guest on this occasion. The Vice President, Shri M. Venkaiah Naidu also presented the Saakshar Bharat Awards – 2017 to the winners at state, district and panchayat level. Speaking on the occasion, Shri M. Venkaiah Naidu congratulated the winners of Sakshar Bharat Awards – 2017 for their contribution in promoting literacy at grass root levels. He said that literacy can play an important role of empowering, transforming and improving quality of life of individuals as well as society. He said that the development has no meaning in democracy without literacy. He added that we have committed to the implementation of the 2030 Agenda for Sustainable Development adopted by all nations at the United Nations in January 2016. The global agenda envisages a “world with universal literacy” and one of the targets set in the agenda, to be achieved by 2030, is specifically focused on youth and adult literacy. Shri Naidu said we have a long way to go as nearly 35 crore youth and adults are outside the literate world. The Vice President suggested ways to achieve universal literacy; firstly to improve the quality of pre-primary and school education; secondly, we must provide opportunities for learning to those who have never been to school or have dropped out of school. He also congratulated Human Resource Development Ministry for taking various successful initiatives to promote quality education and literacy in the country. On the occasion Shri Prakash Javadekar told that literacy rate from 18% in 1947 has now reached to 81% approximately till date. He said that we should identify the potential children who are not going to school and must get them enrolled in schools. Also every literate person in the family must educate other illiterate persons of the family. The minister assured that next year government will start ‘School Chalo Abhiyan programme. These efforts will help overcoming the remaining 19 % illiteracy and we will be able to achieve 100 % literacy and 100% digital literacy by 2022 which is a dream of our Prime Minister Shri Narendra Modi. Minister of State for Human Resource Development, Shri Upendra Kushwaha said that the time has come when the last man in the line has understood the importance of education in our life and even an underprivileged person wants his child to be educated and literate. He assured that the ministry is making efforts to achieve 100 % literacy in our country. He also said presently apart from functional literacy we are also focusing on various other kinds of literacy like Financial literacy, Digital literacy etc. Addressing on the occasion Minister of State for Human Resource Development, Dr. Satya Pal Singh said it is the responsibility of the government to provide schools, colleges, teachers and infrastructure to ensure quality education but it is the responsibility of the parents to send their children to schools. He requested to follow our ancient education system in which the aim of education were to provide good training of skills to the students and to enrich their knowledge, character and personality for overall development. Smt Rina Ray, Special Secretary, Department of School Education and Literacy gave vote of thanks on the occasion. Among the dignitaries Shri Anil Swarup, Secretary (Department of School Education & Literacy), Mr. Shigeru Aoyagi, Director, UNESCO, New Delhi were present on the occasion. The message of Ms. Irina Bokova, Director – General, UNESCO was circulated on the occasion. In the message she said that the International Literacy Day offers a moment to review the progress and come together to tackle the challenges ahead. She highlighted that the digitally-mediated knowledge societies are changing what it means to be literate, calling for new and higher-level literacy skills. Therefore, this year, the event is devoted to better understanding the type of literacy required in a digital world to build more inclusive, equitable and sustainable societies. 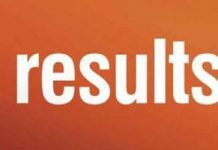 Saakshar Bharat Awards were instituted to encourage a healthy competition for better performance among the programme implementing and support agencies. The Awards also recognize the achievements and invaluable contributions of functionaries and volunteers in the field of adult education and skill development. Each Award carries a trophy and a certificate. A total of 11 Saakshar Bharat Awards were given this year. 1. State Literacy Mission Authority, Bhopal, MP.